The holidays are a time for family, friends and decorating! It’s time to pull out the string lights, garland and ornaments and show off your skills. While decorating an apartment can be a bit different than decorating a house, there are still endless possibilities to make your space feel festive. One of the simplest ways of decorating is to swap your pillows and blankets for more festive colors and prints. Choose a classic color scheme of various shades of red and green or go more modern with gold, white and cream. The pillows and blankets will also make your living room cozier as the days get colder. String lights take up virtually no space at all and make any room look festive and feel inviting. Hang them around doorways, along the ceiling, or on your balconies railing. If you live in Schuyler Commons or Excelsior Park you’ll be able to easily control your lights from the Smart Home Automation App. Realized you forgot to turn the lights off before crawling into bed? Just open the app and tap the button to turn your lights off! The app is also great for letting in friends and family when they come and visit. If you’re busy doing some last-minute shopping when your guests arrive you can unlock the door for them. No more worrying about making it back in time! Garland is a great way to add pops of green into your living space. 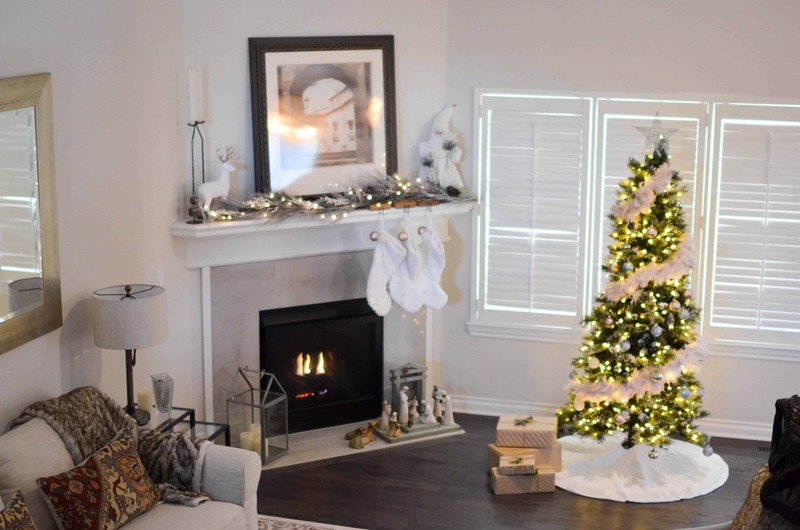 Add ornaments, lights or ribbon around the garland to dress it up and make it look even more festive. Once your garland is complete, place it on top of your fireplace mantle, around a mirror or along your entertainment center. Just like with blankets and pillows, you can easily swap out pictures and wall décor for more festive options. Wreathes and wooden holiday themed signs are a great way to decorate without taking up space. No matter how you choose to decorate this holiday season, have fun with it and don’t be afraid to try different things! Your festive touches are sure to make your home warm and welcoming during this exciting time of year.